Slad Farm is on Corse Lawn Common and set in 4 acres of gardens. 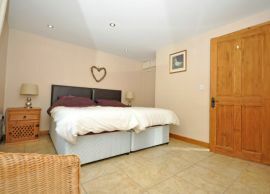 The holiday cottage has recently been built to a high standard with all modern fixtures and furniture. 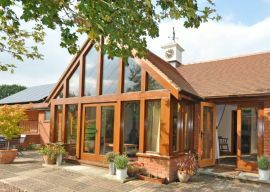 The general appearance is of oak the front window is a main feature with the theme being carried in to the kitchen and dining furniture, it is a large open plan barn style living area with 2 ensuite bedrooms leading off the main room. There is an open woodburner which is very effective and gives the room a cosy feel. 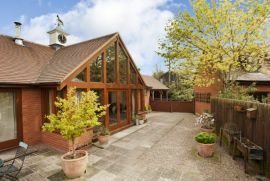 The area is ideal for exploring the Cotswolds, the Forest of Dean and the Malverns as it is in the middle of them all! There are some interesting towns nearby including Cheltenham, Gloucester and Tewkesbury. The 3 cathedral cities of Gloucester Herefordshire and Worcester are all within easy reach. Great for dogs Lots of space and many good walks nearby! All accommodation is on the ground floor,both of the showers in the ensuites are extra wide for easy access. Not wide enough for wheelchair users. Small private courtyard with patio table and chairs also sun loungers. Slad Farm is on the B4211 The main land mark is The Corse Lawn Hotel. We are 1/4 mile south of the hotel the 7th house towards Gloucester. Low Season: full week £395.00 short break. 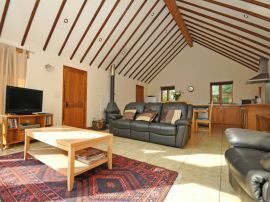 Mid Season: full week £595.00 short break. 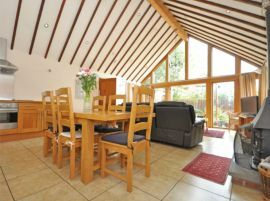 High Season: full week £695.00 no short breaks. Short breaks Saturday - Tuesday or Tuesday - Saturday. The accommodation is lovely the picture do not do it justice,everything we needed for a perfect holiday , the owners were nearby so if we needed anything we only had to ask.